tallgrass prairie studio: Spring to Finish...How'd We Do? Spring to Finish...How'd We Do? 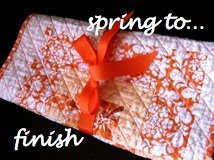 May is here and the spring to finish challenge is over, though I'm going to continue right through May because there are still quilt tops from last year hanging in my closet. I can't wait to see how many finishes we made all together. Thanks for participating with me....so, how many finishes did you have? I'll announce the winner on Monday. International Folks....if you want to participate in the raffle for the quilt in the previous post...paypal works to send the money for your donation. Also, you may want to put your email as the contact on the ticket. That would save the ladies money! Just drop me an email and we'll work it out together. Thanks so much for everyone who is taking a chance on the 'wonderland garden' quilt! I finished up one quilt last night before midnight uk time and sadly the second one this morning, so at least that gives me one entry!! Hey Jacquie, I did finish one top and posted a few days ago. Don't know if you saw it or got the e-mail I sent? I know you are extremely busy. I swear I just don't know how you do it all. Thanks for doing spring to finish, it really got me going on my binding. Hi Jaqcuie, I actually got five finished early in the month, and three more bound last night (baby size!) So, my total finished for the month is Eight! whew! and yes, I will keep going...I am completely smitten with quilting! I have three finished. Doll quilt, wedding quilt and a yet to be posted finished quilt top. I know that the last quilt isn't put together yet, but my goal was to get the top finally pieced together after a year of working on it. I feel good! I am going to continue too. I plan on getting that second quilt completed this weekend. Then progressing onto some shams that match the quilt. Hm ... I think that's technically 2 finishes of old projects and 1 new-to-finish-in-April for me :-). Thanks for hosting, it really did push me to get some of these out of the Languishing Pile. I finished 3 projects! I have several more ready to go, thanks for the momentum. I only finished one (out of about eight). Worse, I also STARTED three! I was forced to drop out of the Spring To Finish challenge due to Quilters ADD! But I joyously salute all you finishers!!! I think I have only one qualifying finish - a quilt I call "Going My Way". I posted on it yesterday. My blooming nine patch was done on Apr. 1 before you issued the challenge. I have a few more finishes I'd like to get done in May. Thanks for the incentive. I only managed to get one older project completed, but I did pull out a few others, so I'll also be continuing during May! Thanks! I managed to do 6 burp cloths, 2 garden aprons, 2 child aprons, a mom and daughter apron, and a headband. -1 baby quilt handquilted, bound and labeled and in the box for shipping. that's 4 completions for me. my drawing isn't complete...and i didn't finish any UFO clothing items. Hi Jacquie I have 8 finishes for the month, 2 were quilts and the rest were baby sewing items for expected grandbaby. Hi, despite my busy schedule, I was able to finish an even dozen projects. A few were baby quilts and the others were finishes of current projects. I am so happy you did this as I really wanted to plow through my UFO's. i finished 6! 3 twin quilts and 3 doll quilts. sadly, it was harder to finish the doll quilts. so thanks to you and your challenge, i was able to finish those 3 doll quilts that were sitting around for a LONG time. thank you!!! Just two for me - a baby quilt and a doll quilt. April seemed to fly by. But thanks so much for the incentive, I am definitely going to continue into May and get some things finished. I finished 4 out of 5 and the 5th that is oh so close. Finished sash + 3 aprons, and just need to bind the baby quilt. Thanks for the incentive! I finished a doll quilt and learned a TON from doing that. I can't wait to try another one. And I finished 4 matching skirts for my three daughters and I. Thanks Jacquie! I finished 2 quilts! Thanks for hosting this challenge! I got 1 project finished (and made good progress on 2 others). Thanks for the kick in the pants to work on these. Just one finish here. But it was a quilt (just posted some photos of it on the blog) so it feels like an extra special big finish for me. Poor quilt top had been sitting around collecting dust for months! Thanks for this little motivator to finish it! OK, no finished quilts since I had a dead sewing machine however I did get 4 other projects done that I had in the works.... Stringing Pearls, Dress for niece, purse for me and blocks for quilt guild car cover. Thanks for the motivation to finish. I hope you are doing better with the loss of Fudge.. Thinking of you. Hi Jacquie - I left a comment on your other post, but I'll reiterate here: I finished three quilts - a baby; a lap and queen. Thanks for the inspiration to get working and more importantly, finishing! I finished up one previously started project in April--my Noah's Ark quilt. I'd hoped to make my son's jeans that I've had cut out for quite a while, but I didn't get to them yet. I have two sandwiches to quilt, I am happy for those and will quilt them as soon as finals are over, so I count them in. And one other project finished - quilt and two pillows, I will count that as one. So put me down for three. Thank you so much for motivation to get to work on those WIPs. I will continue on... for sure. I finished 4 items. The Oriental Tiles quilt (and it's sent to its new owner), the pillowcase totes (they're sent too), an aloha shirt and a baby quilt. Just need the binding, but I consider it finished because the quilting is the hardest part for me to finish. Yay, thanks so much for the push to get stuff done. I'm going to continue through May as well. I'm trying to remember if this was only for quilting finishes...I ahd a few others, you can make the call Jacquie! I haven't even had time to blog about most of these. I am definitely continuing with the Spring to Finish plans though, this was a great incentive! Well I am still working on my finishes truth be told, but I am SOOOO happy to have gotten 3 BIG quilts all quilted (almost) and they are ready to be bound! SO even though I didn't truely finish any of them I got 6 quilts ready to quilt, 3 quilted and by the end of the weekend I'll have them all done and will be VERY happy to have stumbled onto your post! I count myself a lucky winner! Still working on a ton of stuff, but I did finish three paintings. If they don't count, no worries. It was fun to play along anyway. Oh, this has been so great! Thank you so much for motivating us! I finished 6 projects and hope to finish a few more in the next month or so! That was awesome. Now, I just need to go catch up on my housework!!! Hi Jaqcuie, Alas not even one, I joined to late and I hand quilt but it will be done this weekend, so a thank you, because without you little push, those blocks would still be in the closet!! Thanks so much for the motivation! I finished seven projects - four baby blankets, a quilt top (finishing the top was my goal), a baby embroidery, and handbag for my church auction. I haven't had such a productive month in a while! OK I only finished one "older" project - but guess it's better than non. I did get started on some other projects that have been lying around and am planning on working through May to finish them - thanks for the motivation! I only managed two finishes, but I have high hopes for May. Is that "Spring to Finish II"? I am going to count 4: two bags, a mini quilt, and a quilt for my mom's birthday. I also finished two quilt tops and a back for one of them, but I won't count them since they aren't "done done!!" I finished two things! One was a skirt for my daughter and the other was my class sample for my beginning quiltmaking class. No finishes here, but motivated to try by the challenge I did move three projects along to their next phase, so for me this "push" was still very helpful. I had two small finishes along with my swap blocks. I finished a top last night that I hope to quilt this weekend :) Hope you have a good one! I am counting that, 1 table runner, and a doll quilt as finishes. So 3 for me! WooHoo, I am ready to finish more this month. I got 5 finishes for April! I'll keep going into May also! Thanks for getting me going! one measly quilt. O.N.E. pathetic. can we do it again next month? I finished 3! I had plans for more - but we had an unexpected trip take up my last 4 days. It's okay - I've got time now to finish up and start more and finish up and start more. . . etc, etc. Hugs! Thanks for the inspiration! I finished only one! But hey, that's one more than I had done last month. My count is FIVE!! yippeeeeee! I've now put my sister's quilt on the back burner as she isn't moving away from home any time soon and will work like crazy over the summer on big girl's baby quilt! hand applique' YIKES AND YOWZERS! Wow, another month? Now I might have to be official. Thanks for this challenge! I have one official finish. I did get 2 projects started and finished in April and lots more organized and further along. This has been great motivation. Final tally for the month, 1. # bags, 2 quilts bound and done, and 1 quilt top finished and ready for my longarmer. Whew. It was a busy month for me. Thanks fo the challenge. wish i had finished more of my list . . . let's see what i get done in may! I finished one--this month was really busy for me so I didn't get to do as much as I'd like. Sadly, I only got 2 small projects done. I am going to try to keep going through May though!